My Little Kitchen: I hate my house! It's official! Our house is far too small for our family. I've totally fallen out of love with it and after being on the market for coming up to 2 years, I've lost all hope of ever selling it and feel like we'll be here forever! I bought the house in 2002 when I was a single girl with no responsibilities and no commitments! The house was fine for just me and I loved it. Then 3 years later I met hubby who moved in with me soon after we met. The house was still fine for the two of us and I still loved it. 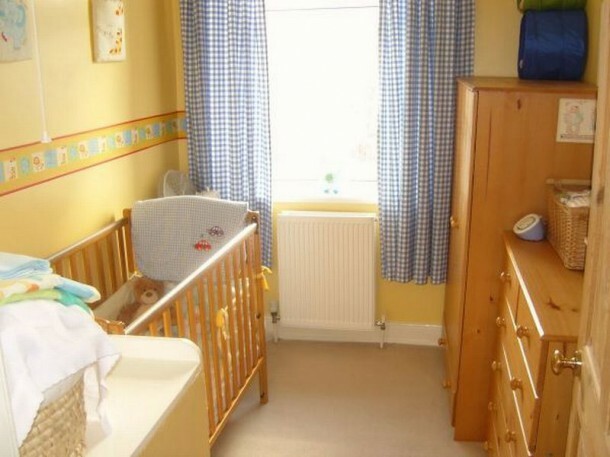 Then Oliver arrived in 2009 and although the house seemed a bit more crowded and was filling up with baby paraphernalia, it still felt ok. We talked about selling but decided not to as we have a really small mortgage and didn't want to end up with a bigger mortgage at that time. So, March 2010 I found out I was pregnant again (a bit sooner than we planned!) and we had to rethink our living situation! Within weeks the house was put on the market and I was hopeful that we would be moved by the time the new baby arrived in December 2010. How wrong could I be! We've had a few viewings but nothing more came of them. Lydia arrived and we all squashed in! The living room before it was taken over by toys! Upstairs there is one double bedroom and one single bedroom plus our bathroom. Oliver has the small bedroom and the bigger bedroom is for me, hubby and Lydia!!! To be honest this doesn't bother me but it would be nice for Lydia to have her own bedroom and we could have our bedroom back for just us (and I could watch TV in bed!) If we're still here in a few months, the plan is to get bunk beds for Oliver's bedroom so him and Lydia can share. The garden is small and all paved apart from a small flower bed and some flower pots (plus a playhouse, slide, trampoline, rocking horse and a couple of bikes!) Also the house is on a main road which is extremely busy with buses, lorries, tankers, you name it! So our garden is not exactly the peaceful haven that I would love it to be! Luckily we have some lovely playing fields with a playground right across the road so that's like an extension of our garden during the summer. So 21 months later we're still here. The housing market has more or less crashed. There are no first time buyers (our target market) as they can't get mortgages or deposits. We dropped the price by 10% but still nothing. We've looked at various other options: 1. Buy a new build house and part exchange ours (but new builds are out of our price range) 2. 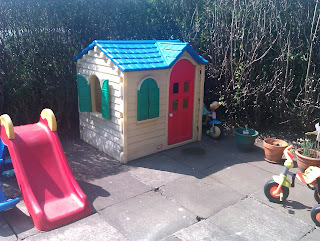 Rent our house and buy somewhere else (decided against this as we would have to quadruple our amount of borrowing). 3. 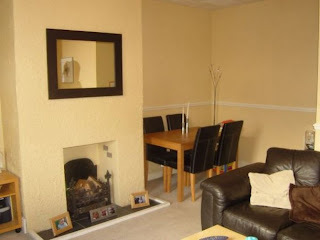 Rent our house out and rent somewhere bigger (I really want to do this but hubby's not keen as he doesn't like the risk of the house being empty). So the waiting game continues! But, we've got a viewing booked for this Saturday morning which is a couple looking for a buy to let property. Please keep your fingers crossed for us! I know exactly how you feel! We live in a coach house a the moment it does have 2 bedrooms, but one we put in ourselves as the lounge was too big! However that bedroom is small, and right with you on on the tiny kitchen, you couldn't swing a cat in ours! We would love another child but lack of space now is putting us off as we would obviously need more room! Hope the viewers like the house, good luck! Wrong side of the road! Fill in the blanks Friday... a day late!